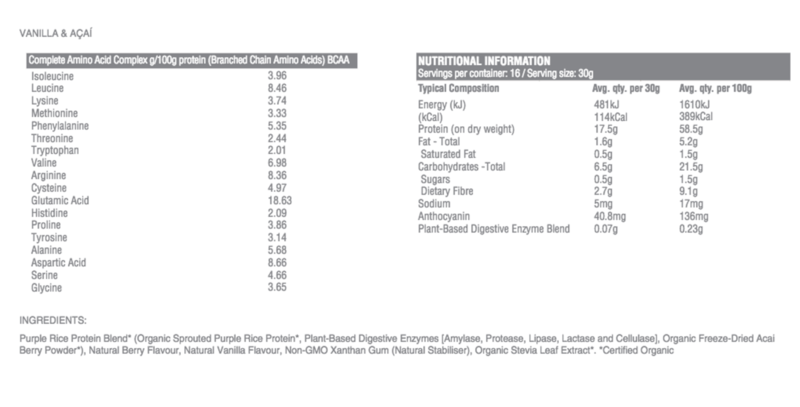 Raw Purple Rice protein is the world's 1st source of protein and nutrients created from sustainably farmed purple rice. Bursting with antioxidants and digestive enzymes to support protein breakdown and to help fight mild inflammation of the body. Raw Purple Rice protein contains high levels of flavonoids called anthocyanins, which give the product its beautiful purple colour. Anthocyanins function as antioxidants and fight free radicals in the body. Certified Organic, sprouted and vegan, this protein is also a natural source of fibre.